Do you want to increase your Facebook engagement? Interested in discovering what content appeals to your audience? With Facebook Audience Insights, you can get the information you need to tailor content to your audience’s preferences. 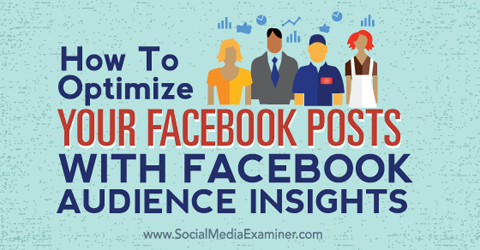 In this article you’ll find out how to use Audience Insights to optimize your Facebook posts. 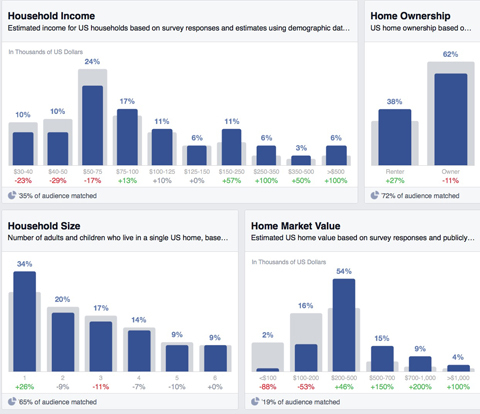 Facebook Audience Insights is a social media marketer’s dream come true. It was designed as a tool for targeting Facebook ads, but it also provides a treasure trove of data on your current audience, target market and competitors’ customer bases. 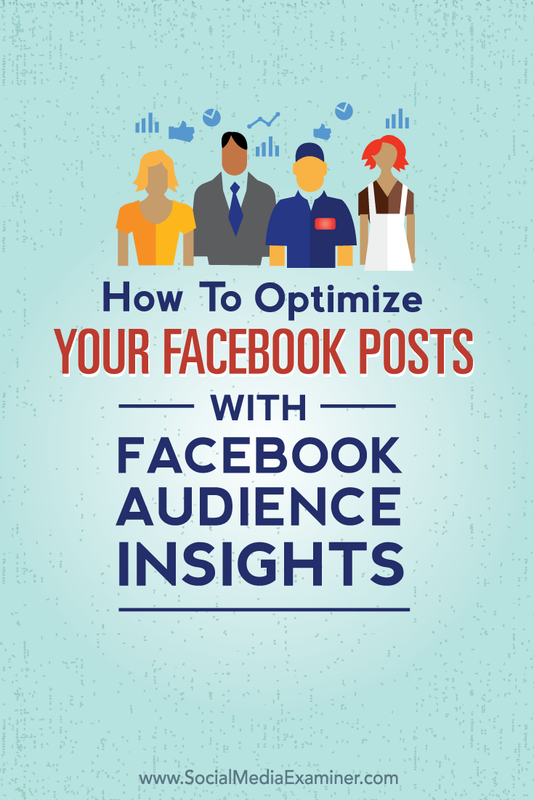 Discover how to optimize your Facebook posts with Audience Insights. Simply plug in your page or a heap of desired demographic data, including age, gender, location, interests, finances, employment, income, family structure, purchase behavior and more. Here are some ways to tap into this data to optimize Facebook posts for your audience, increasing organic reach and engagement without advertising. The Lifestyle data in Audience Insights creates mini-personas based on demographic data, purchase behavior, brand affinity and interests. Though the personas are rather broad, they lay the foundation for a comprehensive picture of who your audience is. Lifestyle insights develop mini-personas based on demographics, purchase behavior, brand affinity and interests. From this snippet of information, you can picture the lives of this audience. You can envision parents driving their children to school in the morning, listening to the radio. After family dinners, the children retreat to their rooms to do their homework on weeknights. You can speculate these are parents who are highly present in their children’s lives. They are involved, informed, and in some ways, defined by their status as parents. So how does this information translate into writing posts that will capture this audience’s attention and motivate them to act? You do it on their terms. Consider what is likely on their minds right now, and how your brand can assist in quelling their anxieties and make their life better overall. When it comes to audience personas, it’s all about framing. Say you’re running a promotion. Could you adjust the timeframe and the scope of the promotion to frame it as a back-to-school campaign? Or more broadly, how could the campaign speak to the everyday joys and challenges of parenthood? For example, the largest Facebook audience segment for Kraft Foods is Apple Pie Families. In this August post the company includes a link to kid-friendly recipes. 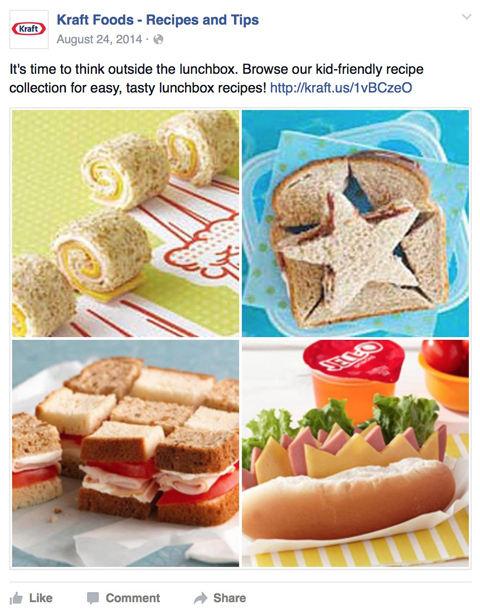 Kraft links to kid-friendly recipes to appeal to their target audience. Understanding that at the time, a large segment of the audience was likely focused on sending the kids back to school, Kraft Foods adjusted their content not only to grab their audience’s attention, but also to provide information people could put into action. 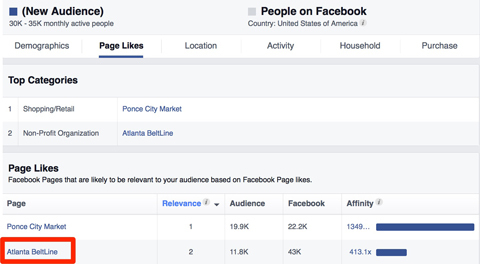 You can learn a lot about an audience segment based on the Facebook pages they like. Think of this information less like a report on other businesses and more like a key interest breakdown. The Page Likes section of Facebook Audience Insights is comprised of the top pages liked in each category and the pages most likely to be relevant to your audience. This combined data helps you continue piecing together a comprehensive persona. Page Likes let you see insight into what your audience’s political affiliations are, which media outlets they follow, where they shop, what organizations they support, what apps they use and more. From a macro perspective, study this data to get into the heads of your audience. Add to the picture you started to form from Lifestyle data. What do these people talk about with their friends? How do they spend their spare time? What issues do they care about? To get more granular, look at each category individually for opportunities to develop content around it. In the example below, the Page Likes data reveals that people who are interested in Ponce City Market (home to restaurants, shops, offices and apartments in Atlanta) are also likely to like the Atlanta BeltLine (a walking and biking path through the city). The Page Likes data gives you insights into the interests of your audience. 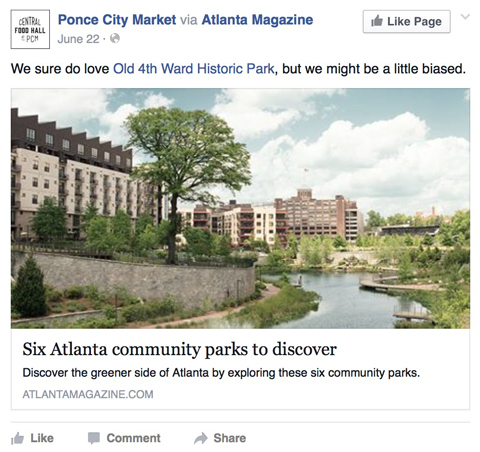 Many of Ponce City Market’s Facebook posts, therefore, focus on outdoor and walkable activities around Atlanta and give an occasional nod to the BeltLine. Find out what pages your audience likes and use that information to create relevant content. The Audience Insights Activity section tells you how your audience segment is most likely to interact with content on Facebook. You can see how likely they are to like, comment on and share pages and posts, click on ads and use specific devices to access their accounts. The audience segment below comprises the 2 to 2.5 million monthly active users in the United States who are interested in L.L. Bean. The blue represents the audience segment’s frequency of activities, and the gray represents all of Facebook. As you can see, this audience is substantially more active on Facebook than the general Facebook population. Look at the audience segment’s frequency of activity compared to that of all Facebook users. From this data, L.L. Bean could conclude that their audience is primed for an engagement campaign. In the last 30 days their audience was about five times more likely to comment on a post than the general Facebook audience. That likely means they’re more willing to share opinions, information and content than other audiences. In June L.L. 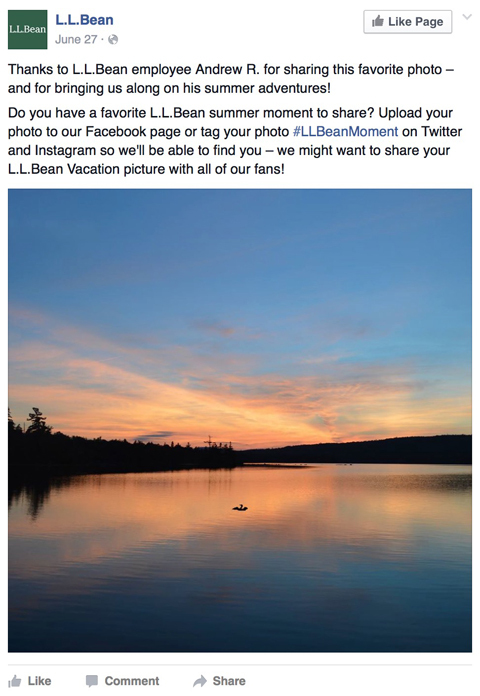 Bean launched a multi-channel, user-generated content campaign encouraging fans to share photos of their favorite summer moments on the retailer’s social channels. L.L. Bean encourages fans to share photos of their summer vacation. Using Facebook Audience Insights to assess how your audience is highly engaged, especially when it comes to something as personal as commenting, is a smart first step before any major call to action. It’s also important to note which devices your current and target audiences are using to access Facebook. While nearly all of your Facebook content should be optimized for mobile anyway, how people are accessing your content can tell you a lot about their mindset when they interact with you. It’s important to know what types of devices your audience uses most often. Image: Placeit. 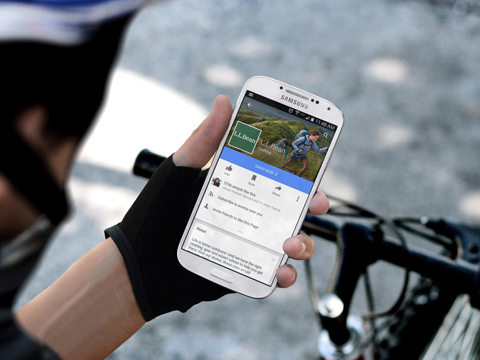 For example, if you’re a brick-and-mortar store and your audience is mostly accessing Facebook via mobile, consider a geo-targeted Facebook campaign to drive foot traffic from people in the area. Facebook Audience Insights can and should be used for more than just assessing the state of your current audience. You should also use it to profile the characteristics of the people you want to reach by looking at the income and make up of their households. For example, if you managed Nellie’s Sports Bar‘s Facebook page, you might plug in users who are older than 21, live in Washington, D.C. and are interested in the three major sports teams in the area. If you look at Household data, you can see that 54% of their audience lives in a household with only one or two people, which means they’re probably single or childless. Also 61% have a household income of less than $100,000 per year. Most of them own their homes, which are most likely to be worth between $200,000 and $500,000. The number of adults and children in a home and household income can tell you a lot about the decisions people might make. This gives you quite a bit of information to work with. The data is helpful in both supplementing other interests and personas gleaned from Audience Insights and gaining a new perspective into this audience’s lifestyle. 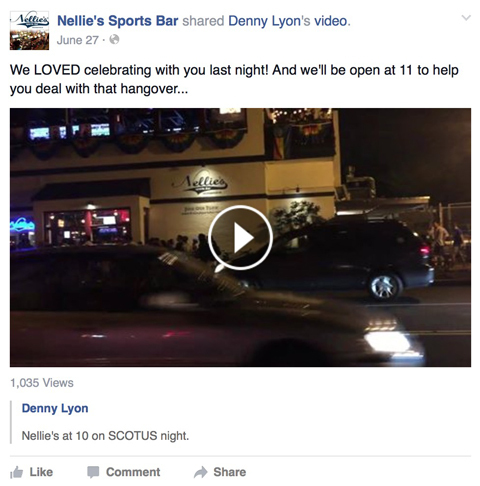 In the post below, Nellie’s Sports Bar reminds fans that the bar opens at 11:00 AM on Saturday. Why is this relevant? Their audience is comprised of adults who likely don’t have children, so going to a sports bar for brunch is completely reasonable. Although they make a good enough living to comfortably enjoy meals and drinks out, they’re not so wealthy that they’re likely to have standing brunch dates at four- and five-star restaurants. Analyze Household data to gain insight into what content will appeal to your audience. Rather than just capturing people’s interests, Household data gives you an insider’s look into how people live their lives. The structure of someone’s home and how much they earn can tell you a lot about the big decisions they might make (like where to live) and their day-to-day choices (like where to have brunch). Purchase Behavior insights work a lot like Lifestyle and Page Likes insights. Essentially, this data lets you see what people care about, what they prioritize, and most importantly, how they spend their money. 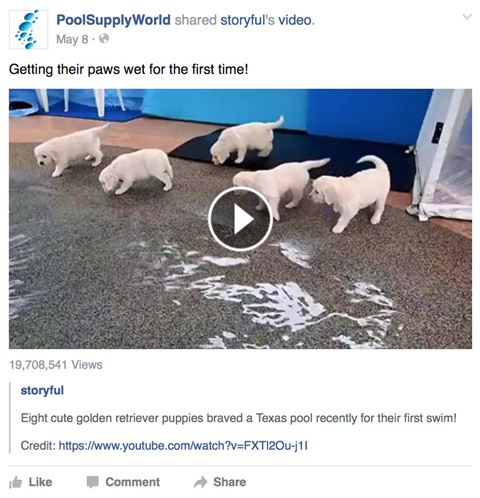 PoolSupplyWorld is an online pool supply company that has become somewhat famous for their engaging and witty Facebook page, which boasts over 99,000 fans. Broadly speaking, if you managed this Facebook page, you might be interested in the purchase behavior of homeowners over the age of 25. According to Facebook Insights, this demographic is 17% more likely to purchase pet products than the general Facebook population. Look at purchase behavior data to gauge the spending habits of your audience. Because of this segment’s tendency to purchase pet products, the Facebook post below makes perfect sense. Create content that focuses on what your audience cares about. 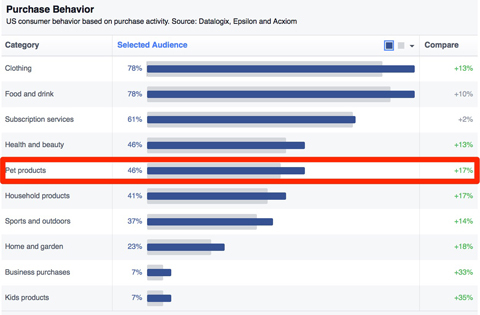 There are other purchase categories ranked on Facebook Insights. You can explore Food and Drink, Clothing, Subscription Services, Health and Beauty, Kids’ Products, Home and Garden, Sports and Outdoors, Business Purchases and more. Though these are broad categories, they shed light on how people prioritize different elements of their life, and how they prefer to spend their time. Regardless of the nature of your business, Facebook Audience Insights can give you a leg up on audience research, and ultimately social engagement. This powerful tool offers valuable data at no cost to you. What do you think? How do you use Facebook Audience Insights to drive your Facebook strategy and grow your business? Tell us in the comments below! L.L. Bean Facebook Page image created with Placeit. 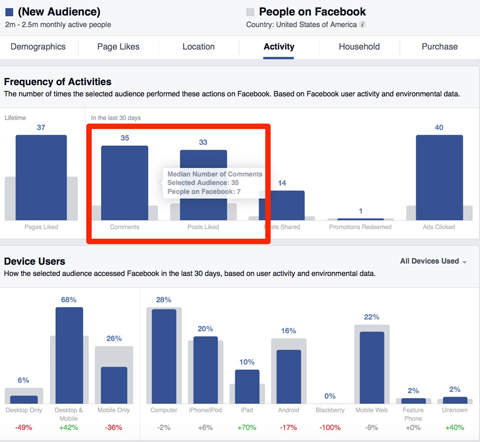 Tips for improving Facebook posts with Audience Insights.